Firstly, we have been asked by the National Trust Ranger at Leith Hill, Ruby Cole, to assist her in raising £6,000 for a newly restored drinking water fountain to be located by the Tower for the 600,000 visitors that come to this beautiful site each year, be they people, dogs or horses. The water fountain is to mark the 250th birthday of Leith Hill Tower. I think this is a very appropriate project for the Surrey Hills Society to support, and easily achievable. Ruby has already raised almost half of this sum but needs help to raise the balance. Secondly, the Prudential Ride London/Surrey event takes place on 10 August and we have been given two free places for sponsored charity cyclists. 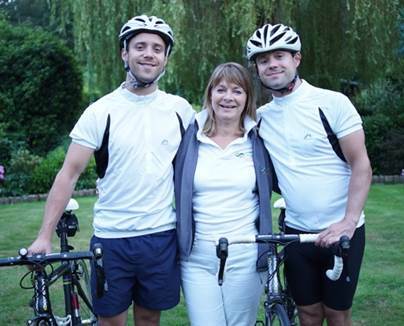 Our two riders for this year are the sons of our newsletter editor, and long-time supporter, Diane Cooper. I do hope you will consider sponsoring our young riders who will be waving the Surrey Hills flag for us on this day. Whilst I recognise that a number of our members may have been adversely affected by the increasing popularity of cycling, this is nevertheless an opportunity for us to derive some benefit to the Surrey Hills. The Cooper boys are proud to be cycling the 100 miles on our behalf and are happy for us to donate whatever sum they achieve to go towards the water fountain. Could I politely invite you to either sponsor the boys, Darren and Phillip Cooper via their Just Giving site at www.justgiving.com/thebrotherscooper or send a cheque made out to the “Surrey Hills Society”, direct to me at Green Grove, Sweetwater Lane, Shamley Green GU5 0UP, to support these three young people in their endeavours. This is an opportunity for us to achieve a positive outcome from having the Cycle Race here in Surrey, an opportunity to help improve the visitor experience at Leith Hill and an example of the way that the Surrey Hills Society can add tangible benefits to the Surrey Hills AONB.